Tiwan is using Smore newsletters to spread the word online. Mack: A boy who's real name is David MacAvoy, but his friends just call him Mack. He consists of the enlightened puissance. This means he is one of the Magnificent 12. This is a group that has to save the world from the Pale Queen, Her daughter Risky, and all her minions before they take over the world. He finds out by Grimluk, one of the Magnificent 12 3,000 years ago, that he is the first of the Magnificent 12 and he has to assemble the rest of them. He has to travel the around the world to find all of them. Also, Mack has lots of fears and phobias, so having to fight monsters, witches, and dangerous people really isn't a good job for him. Stefan Marr: A really strong bully who fears nothing. He used to bully Mack until Mack saved his life because his arm got scraped with glass and Mack used his shirt and wrapped it around his arm to stop the bleeding. After he did that he called the cops, so Stefan got rushed to the hospital, so that's how Mack saved Stefan's life. He now acts as a bodyguard of Mack protecting him on his journey from danger or any other dangerous thing. Jarrah: She is one of the M 12. Mack finds her at Uluru, a mountain that has been eroded in the Australian Outback. Her mom. Karri Major, is a an archaeologist. Now Jarrah is traveling with Mack and Stefan to gather the rest of the M 12. Xiao: a member of the M 12 that Mack, Stefan, and Jarrah found at Beijing. Also the daughter of the old Magnificent 12, Shen Long. Dietmar: A member of the M 12 that they found in Germany. He's the great 149 times grandson of Grimluk, the member of the old M 12 that helps Mack on his quest, and Gelidberry, the wife of Grimluk that got killed by Risky. Risky is the Pale Queen's daughter. The book is about a boy having to gather a group called the Magnificent 12 in 35 days. He has to do that before the rulers of all monsters, The Pale Queen, gets out from her 3,000 year sentence. He will be having to travel around the world to find the rest of the M 12. 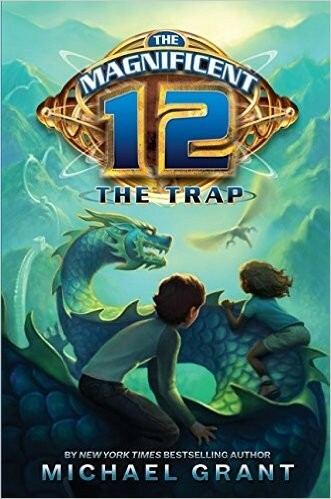 The book starts by Mack, and Jarrah having to travel to Beijing to find another member of the M 12. They soon find out the member is a she and her name is Xiao. What leads to the climax is Mack, Stefan, and Jarrah getting off the airplane to Beijing and Paddy(Nine Iron) Trout tries to kill them. He has a suitcase and unzips it and a bunch of Lepercons come out. The Lepercons try to kill them and are trying to fight, but they are too strong together. They also had needles and they were jabbing them. Jarrah used Vargran, a type of spells, and made the Lepercons grow big and blow up. After that they grabbed their bags and fled ans fast as they can so Nine Iron wouldn't catch them. The resolution is Mack, Stefan, Jarrah, Xiao, and Dietmar trying to find another member of the M 12 named MacGuffin. Mack and Jarrah also practice their Vargran on a Ferris Wheel with the rest of the " Magnificent 5." The main problem of the story is that Mack has only 35 days to gather the rest of the Magnificent 12 or the world will perish and there's only 2, himself and Jarrah. He's involved with the conflict because he has to gather the rest of the M 12 in 35 days or the world will be destroyed. He can solve the problem if he finds all the M 12 and stop the Pale Queen, but there's one thing one of the Magnificent 12 serves the Pale Queen so now it's the Magnificent 11. The title is important because it tells you that there will be something to do with 12 people. Also it tells you about THE TRAP that Mack has to discover out before it happens to them. The title of the book relates to the book as a whole because it gives you information about what will happen in the book. If I could give this book another title I would call it Mack's Adventures. I think the book was pretty good. I felt this way because it kept you on your feet with it's action, adventure, and suspense. I think the book is good already, and it doesn't need anything else to make it better.